Runtime: 2 hr. 45 min. L’italiana in Algeri espouses the cause of women's rights through the resourceful way its protagonist, Isabella, deals with the coarse Mustafà. Rossini was only 21 when he triumphed with this two-act farce, which consolidated his personal style and his status as the rightful heir of 18th-century opera buffa. Great arias and dazzling ensembles – like the one punctuated by onomatopoeia at the end of the first act – are just a few of the gourmet dishes on this hilarious Rossini menu. 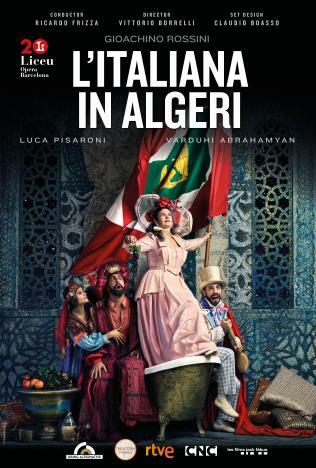 It has been 36 years since L’italiana in Algeri was last seen at the Liceu. Riccardo Frizza will be back in the orchestra pit with an entire cast of specialists in this style of opera on the stage. The bright colours of director Vittorio Borrelli's mise-en-scène are very much in keeping with the imaginative spirit of Rossini's sparkling music.